Sometimes you need a spot to place your baby when you can’t hold him or focus on him for a moment or two. These situations naturally arise during the course of every day, and it’s essential that you choose a safe place for your baby to play. There are some benefits to using a walker, but the detriments are safety-related and should be considered carefully. Baby walkers typically feature an assortment of engaging toys and gadgets for baby to use while he sits in it. 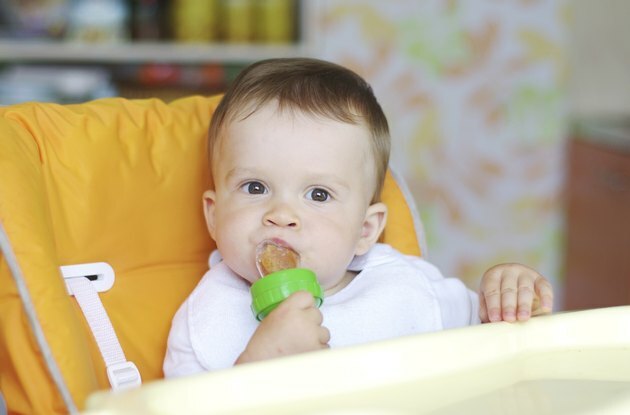 Many babies enjoy these toys, so yours is likely to stay content and happy while sitting in a walker. Remember, if you choose to use a walker, it should only be used in an area that is not near stairs or other hazards and only for short periods of time. The cons associated with a baby walker can be potentially serious for your baby’s development and safety. A little one sitting in a walker could suffer an injury due to rolling down stairs or into water, such as a swimming pool, cautions the American Academy of Pediatrics. A baby might also have the ability to access dangerous areas of your home while in the walker, which could lead to burns or poisoning. The AAP warns that too much time spent in a walker could actually delay the onset of walking. Consequently, the AAP advises parents not to use baby walkers.